Ultrasonic Liquid Level Sensor - SILVER AUTOMATION INSTRUMENTS LTD.
Ultrasonic sensor is a sensor developed according to the feature of ultrasonic and ultrasonic liquid level sensor is one of the ultrasonic sensor. Ultrasonic is a kind of mechanical wave with higher vibrational frequencies than the sound wave, which is generated by vibration of transducer under excitation of voltage. It has the characteristics of high frequency, short wave length, small diffraction phenomenon, especially good direction and directional propagation as ray, etc. What's more, ultrasonic has a great ability to penetrate liquid and solid, especially in an opaque solid, in which it can penetrate to the depth of dozens of miles. The ultrasonic wave will generate the remarkable reflection to form the echo when it encounts the impurity or the interface and Doppler effect will be produced when it comes across active objects. Therefore, it is of great necessity for ultrasonic testing to generate ultrasonic and receive ultrasound since it is widely used in industrial, national defense, biomedical and other aspects of ultrasonic as a mean of detection. The device that accomplishes this function is traditionally called the ultrasonic transducer, or ultrasonic probe. 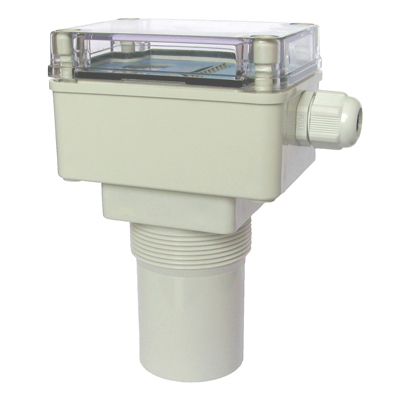 Ultrasonic liquid level sensor set non-contact switch, controller, transmitter in one, suitable for small storage tanks. With its flexible design, EchoPod ultrasonic level sensor can be applied to integrated system or replace the float switch, the conductivity switch and the static pressure sensor, also adapted to the comprehensive application of fluid control and chemical feeding system. As for application, it is also a good choice for small tanks of machines, brakes and other equipment.Sensors of PVDF can be applied to mud, corrosive media. Ultrasonic liquid level sensor is widely used in a variety of atmospheric pressure storage tanks, process cans, small cans and small containers, pump lift stations, waste water storage tanks, etc. 1. The range of it is 1.25 meters. 3. DX10 output: 0~5V voltage signal. 4. Probe material PVDF, acid and alkali corrosion. 5. Narrow beam angle: 0 degrees, static tube technology is available. 6. WebCal software calibration, protection grade: IP67.